After the simple fuselage exterior was created and some time was spent on smoothing it, I moved on to creating the vertical fin and rudder. 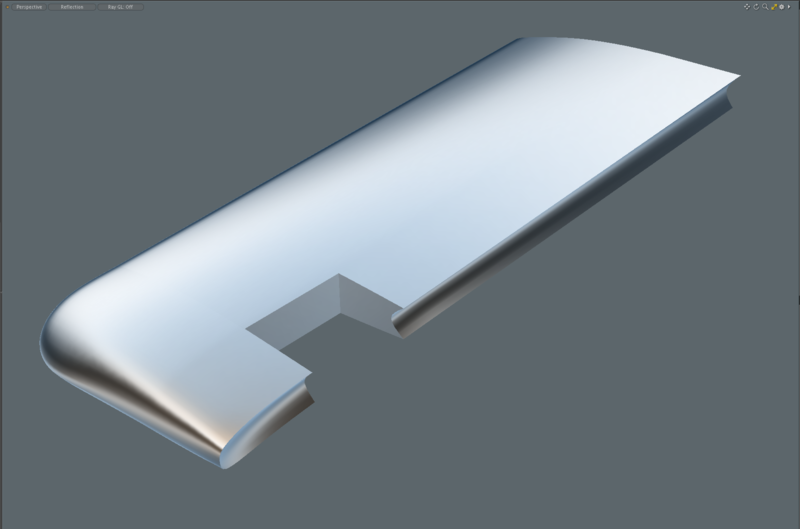 The vertical fin would be attached to the upper rear fuselage by simply penetrating the upper rear fuselage, in MODO, (since NURBS allows penetrating parts to be considered "solids", for the purpose of machining) and the rudder would be a separate part. The original plan was for me to create a P-51D fuselage alone, and not to create the wing and horizontal tail parts. 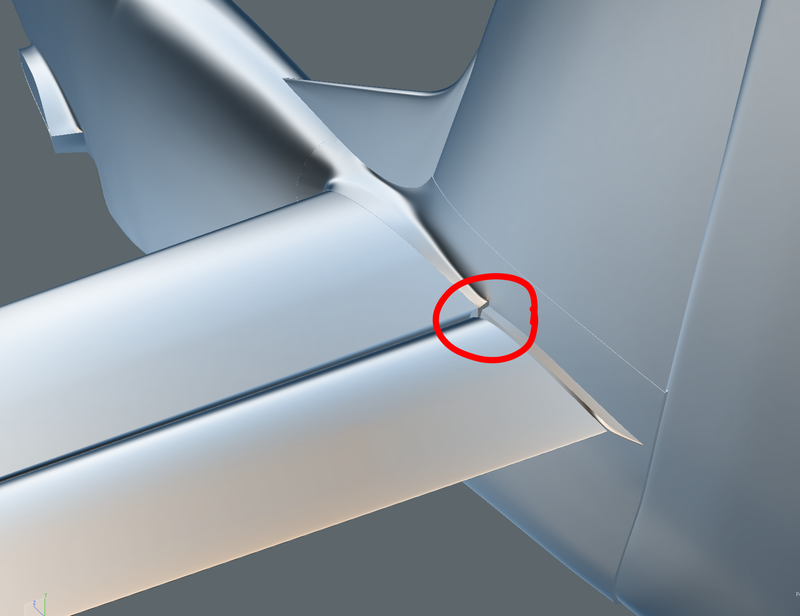 During the time I was modeling the fuselage, we decided to add RC-style "wing stubs", so that left-right wing panels could later be plugged into them. Referring to the "surface finish" discussion the customer and I had earlier, the image below shows how the first iteration of the fuselage was planned. 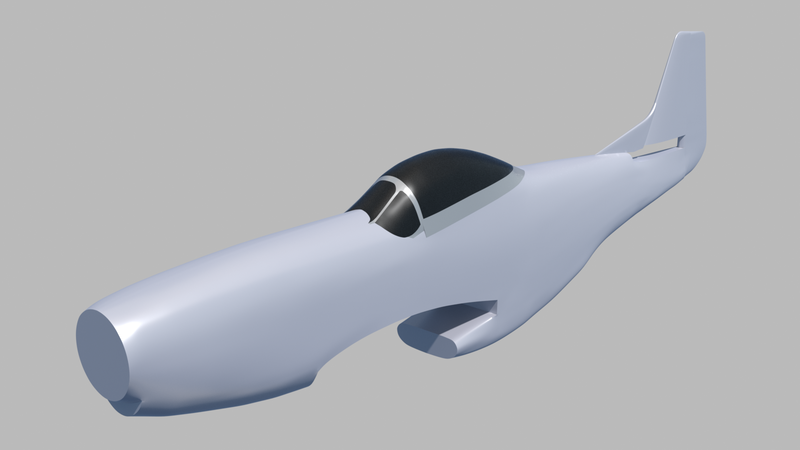 Note that the area representing the over-wing fuselage fairing was built into the fuselage geometry, and the RC-style "wing stubs", have been added. This plan was quickly revised to include a one-piece wing, with no aileron or flap cutouts, and a horizontal stabilizer with no elevator cutouts. The design intent at this point was that the customer would research airfoils, think about copying the original aircraft's control geometry or not, and add these things later. If molds were created, this would be pretty easy, since various control surface dimensions could be tried, without affecting the plugs. During this step, my customer asked if I could duplicate the "rib detail" on the vertical stabilizer. (The rudder on the P-51D was actually fabric-covered, and so there was some fabric "sag" visible there.) 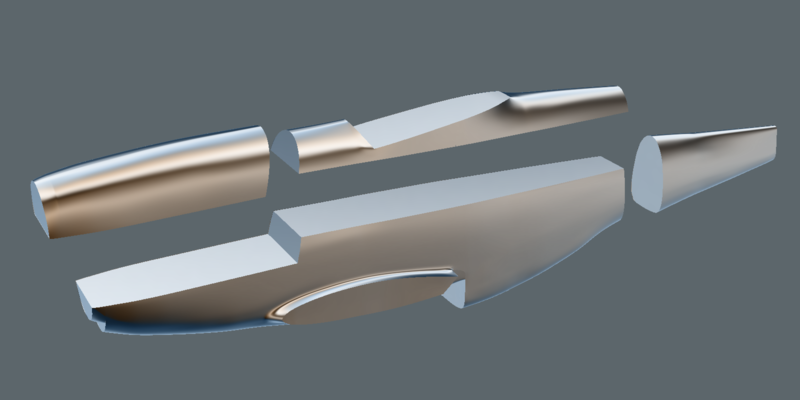 This isn't terribly difficult in MODO, as long as the rib positions are modeled accurately, so that there's enough space for the sag to move inward slightly. For visualization purposes, I created a simple front and rear canopy part. This helped us see that the model was indeed looking like a P-51, although these parts were discarded and remodeled later, for better accuracy. 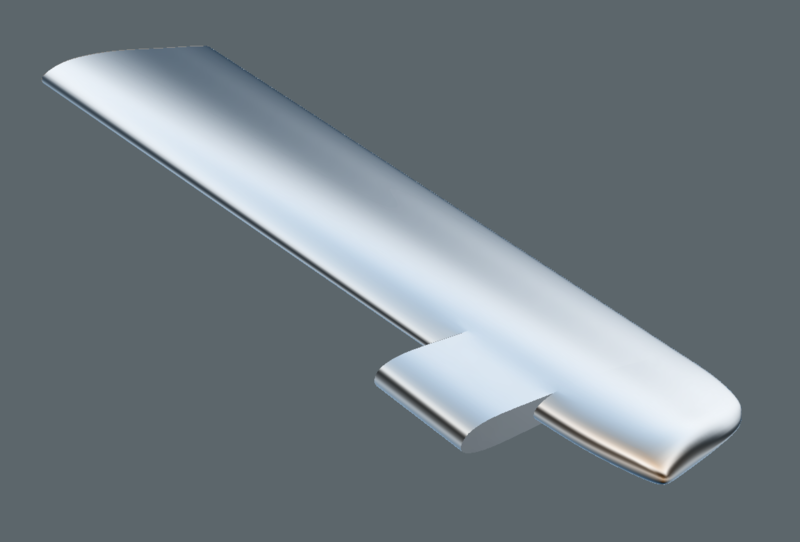 Next, the horizontal stabilizer were given appropriate trailing edge curves, which match the leading edges of the elevator. (On the vertical stabilizer, this included a rather deep area for the counterbalance at the bottom of the rudder.) 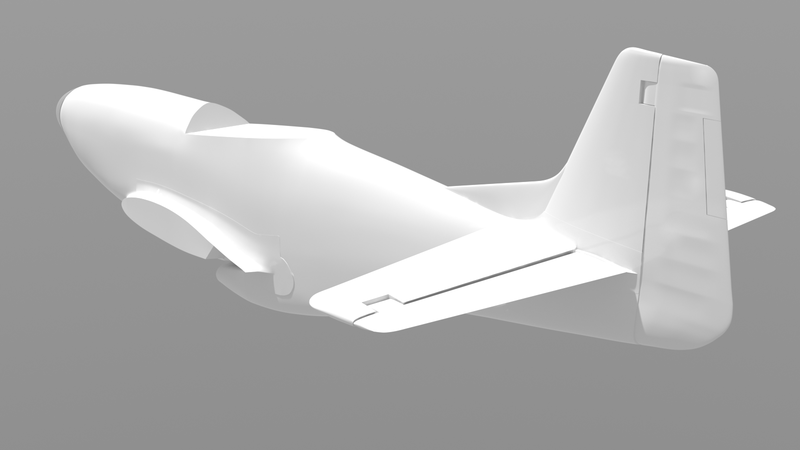 My customer and I decided on this method, (somewhat "RC-ish") rather than what was on the actual aircraft, because this version will fly much slower than an actual P-51, and probably the hinge mechanisms will be simpler. 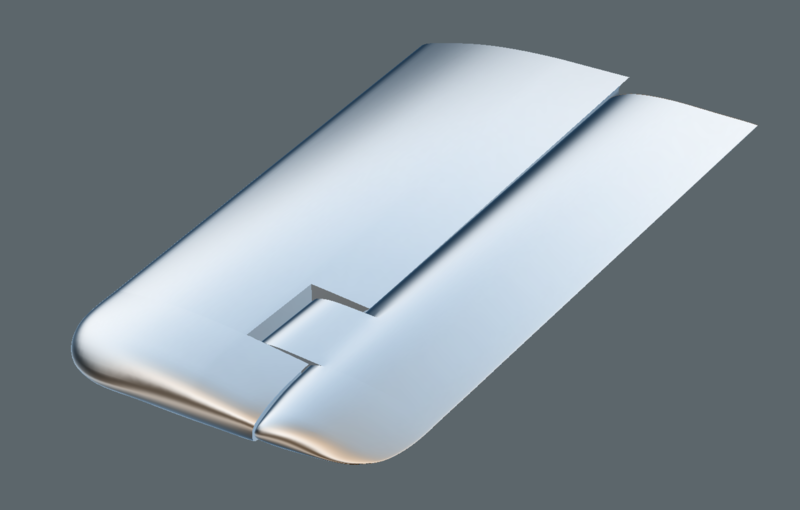 Similar hinge-areas were created for the vertical stabilizer, and for all the trim tab cutouts. 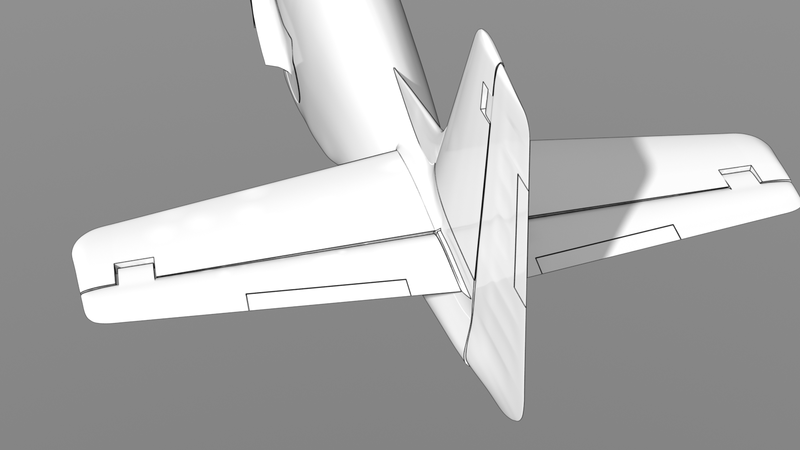 I also cut out the trim tabs on both the vertical and horizontal stabilizer, for added realism and functionality. Here are the results. Click the "Page 03" link below, to continue.